Active fund management is outmoded, and a lot of stock pickers are going to have to find something else to do for a living. The debate about whether you should hire an “active” fund manager who tries to beat the market by buying the best stocks and avoiding the worst—or a “passive” index fund that simply matches the market by holding all the stocks—is over. So says Charles Ellis, widely regarded as the dean of the investment-management industry. If he is right, hordes of portfolio managers will eventually be thrown out of work—and financial advice could end up cheaper, better and more plentiful than ever before. 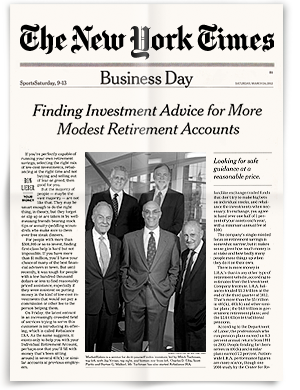 Mr. Ellis, 76 years old, is revered among money managers. He is the founder of the financial consulting firm Greenwich Associates, a former adviser to Singapore’s sovereign-wealth fund, the author of 16 books and former chairman of Yale University’s investment committee. In an article in the latest issue of the well-respected Financial Analysts Journal, Mr. Ellis argues that fund managers equipped with sophisticated analytical tools, electronic trading and instantaneous access to news are engaged in an arms race resulting in a kind of mutually assured destruction of outperformance. No one gave a hoot about fees in the 1980s and 1990s, when 2% in fund expenses barely made a dent in the 18% average annual returns of U.S. stocks. But since the beginning of 2000, stocks have returned an average of just 4% annually. A 1% fee is a quarter of that return. Fees will come down because they have to. And that, Mr. Ellis warns, will lead to “a wave of creative destruction” comparable to the changes that swept through the steel industry decades ago. “Part of me thinks he’s right, part of me doesn’t want him to be right,” says Theodore Aronson, an active manager who oversees $25 billion in institutional assets at AJO in Philadelphia. Humans always have believed in magic and miracles, and investors will probably never stop hoping to find the next Warren Buffett under some rock. Furthermore, some managers will beat the market, some by skill and many by luck alone, even in today’s hypercompetitive environment. While no one has ever come up with reliable ways of identifying those managers ahead of time, that won’t stop many investors from trying. So active management won’t disappear entirely. But index funds and comparable exchange-traded portfolios now account for 28% of total fund assets, up from 9% in 2000. And no wonder. Over the past one, three, five and 10 years, only one-fourth to one-third of all stock funds have beaten the index for their category, according to investment researcher Morningstar. Meanwhile, index funds effectively match the returns of those market benchmarks at fees that often run only one-tenth of those of active funds. But the net supply of outperformance always is zero; one fund manager can beat the market only at the expense of another who must lag behind it. And owning index funds is neither easy nor quick: You must give up all hope of ever beating the market, resign yourself to a stupefyingly boring portfolio and wait years for the advantages of the cost savings to pile up. So there isn’t any reason—other than human nature—for investors not to put all their money into index funds. Or, if you like, reserve a tiny fraction for managers who are so active that they thumb their noses at market benchmarks. One obvious destination, he says, is financial planning. Tens of millions of Americans need a financial adviser, but only a few hundred thousand advisers are available—many of whom aren’t investing experts. Who better to fill the insatiable demand for financial advisers than former portfolio managers who know firsthand how hard it is to beat the market? This way, Mr. Ellis says, “investors will get better, more-valuable service from smarter people.” In short, many stock pickers should get out of the business of managing investments and get into the business of managing investors. Corrections & Amplifications: Charles Ellis is a former director of Vanguard Group. This column failed to note his prior connection to Vanguard.